Are you trying to save a little money when it comes to servicing your car in Batesville? Take a look at these great car service and maintenance coupons. Keep your car and wallet happy at the same time! Just print one off and bring it in today! The ultimate compliment you can give us is to refer your friends and family to our dealership. We appreciate your trust and will do everything possible to earn thier business. As a thank you, we will mail you $50 for the referral if they purchase a vehicle. Customer must notify sales person about the referral at the time of their purchase. 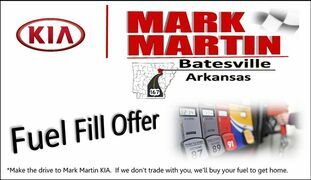 Mark Martin Kia fuel offer. Make the drive to Mark Martin Kia. If we don't trade with you, we'll buy your fuel to get home. Offer not valid if loan cannot be obtained or if trade allowance requested is above current market trade value based on vehicle condition.